Well, today I realized I had all three and I needed to do something about it. That something was to bake a lemon yogurt cake with marmalade glaze. 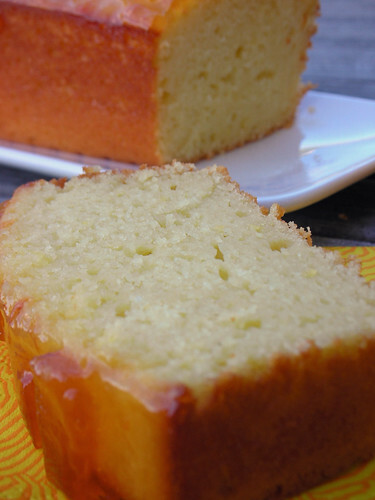 Yogurt cake is a cousin to pound cake…the cousin you call on when you don’t quite need all those pounds, if ya know what I mean. The yogurt keeps it tender and a little oil keeps it moist. It has a light texture that’s a bit spongier than pound cake. This is particular recpie is one that my friend P photocopied for me from Bon Appétit magazine a few years ago. I only have the recipe itself, and not the article associated with it, but I noticed that it bears a striking similarity to a recipe I’ve seen in Baking: From My Home to Yours by Dorie Greenspan. After a little Internet research, I found that it is in fact a Dorie recipe– a slightly altered version of what’s in her book. While I’ve made another lemon yogurt cake here before, I’ve actually baked this one a few times, too, with assorted maramalades on top, making my own small tweaks along the way. I prefer to cut down a bit on the oil in the original version and ramp up the lemon. I’ve made those changes in the recipe below, but I link to the original as well. This cake is happy and sunny; sweet but with a little pucker from the marmalade. And loaf cakes are easy to make, giving you the sugar high you’re after with minimal effort. Speaking of which, I’m sending this over to Tartelette who’s hosting a sweet-tart, citrusy version of Sugar High Friday (started by Jennifer The Domestic Goddess) this month! -Position rack in center of oven and preheat to 350°F. Generously butter 8 1/2×4 1/2×2 1/2-inch metal loaf pan. -Sift flour, baking powder, and salt into medium bowl. -Combine yogurt, sugar, eggs, lemon peel and lemon juice in large bowl; whisk until well blended. Gradually whisk in dry ingredients. Using rubber spatula, fold in oil. -Transfer batter to prepared loaf pan. Place cake on baking sheet in oven and bake until cake begins to pull away from sides of pan and tester inserted into center comes out clean, about 50 minutes. -Stir marmalade and 1 teaspoon water in small saucepan over medium heat until marmalade melts. Brush hot mixture over top of cake. Let glaze cool and set before cutting. YOu are so creative. I can so relate to the lemon and yogurt. I love recipes like this that are produced from stuff lying about! Yum! The title was enough to grab my attention, but the picture even more so. Looks AND sounds delicious! Thank you for participating! 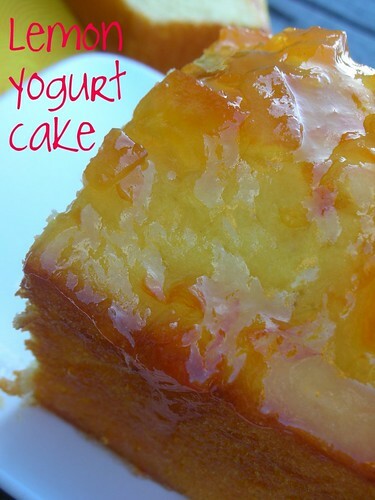 I love lemon yogurt cakes…first cake I ever baked as a child! The marmelade on top is a great touch! i’ll take a slice!! love lemon cakes, all shapes and sizes. a marmalade glaze sounds wonderful! Mmmmm… looks divine! Perfect for SHF! I can attest to the Dorie recipe. I made it a couple of months ago and I still remember how good it was! Light and fluffy and tart too. It was one of my favorite cakes ever. The color of it is mighty enticing too! OMG Steph…I have to make this ASAP. I am just finishing up a post for my blog on LEMON and how crazy I have been going for it lately. I am about to get a bag of Meyers from a friend, I CANT WAIT. Yum! Cute note about yogurt cakes being the cousin of pound cakes. I need to call on those relatives more often! Ha. This looks beautiful and delicious! I will definitely have to make this! I love marmalade, sadly I am the only one in the family who likes it. If I make this cake, I’ll have to finish it off all on my own…..that would be a sin!!! Oh, Steph… That is so sinful! I have the exact opposite thing with plain yogurt – it just doesn’t stay around long enough. This cake certainly looks intriguing – it has that lush look to it. Is the 1/2 c. flour correct? I’ve seen 1 1/2 – 2 c. in other similar recipes. Thought I’d check. Thanks. I just made this and popped it in the oven a second ago. Is it really supposed to be only 1/2 cup of flour? The batter was really runny for a loaf cake, and the recipe on Epicurious calls for 1 1/2 cups. I went ahead and threw in the extra cup just to be on the safe side, but now I’m curious. judi0044 and Cheryl– Oh my gosh, I should hire a proofreader! Thanks for catching that, and I’ve corrected my typo. Cheryl, I’m glad you checked Epicurious and went with your instincts! This cake gets better the next day, too. Thank you! Mine only has a few minutes left in the oven, and it smells sooooo good! I had to make a bunch of changes to it, since I didn’t have some of the ingredients on hand, but I think it’s going to turn out. I’ll blog about it this evening when we taste it! Cheryl– It seems to be a relatively flexible recipe, so hope it comes out good. I’ll check your site to see the reviews! Looks so moist and I love the simplicity! I’m saving this for use hopefully in the near future! Wow, I cannot wait to try your recipe! I always always have half a tub of leftover yogurt in the fridge ’cause I’m the only one in our house who likes plain yogurt and I can never finish it fast enough… 🙂 You’ve provided me with the perfect solution! Thank you for the recipe! Yuuummmyyyy!! Just made it. Moist and delicious!